It’s summer in Kiev, it’s a national holiday (or there was just a concert downtown, or football – right away, there are parts I am no longer sure of), there is a fair amount of revelers downtown, some of them drunk, and these two security guards are particularly drunk and belligerent, and they’ve just graduated from verbal abuse to touching, and between encountering them and what is happening now no more than a minute has (probably) passed, and I am too stunned to do anything about it in that very moment, so in that very moment, a Berkut officer gets them off of me with such frightening efficiency that I am too scared to thank him at first, lest he is about to go after me next. I am leaving a lot of the details deliberately vague. Some don’t matter and others are in doubt. I exist in time and time has obscured my vision, placed roadblocks between me and that day, roadblocks between him and I, on top of the ones that existed there in the first place. I know we walked the length of the street and that I was embarrassed for a long time before I realized he was also embarrassed. He must have recently gone off-duty, and I’m sure there was some kind of protocol he was breaking. Timing is everything, and I’m pretty sure he asked for my number at the very end of the street. Or, perhaps, he didn’t really ask as much as expected it. That same summer, I was on a boat, and what I first remember from that boat was a sudden wind that made my hair stick to my lipgloss-covered mouth in a very annoying way. There are other memories, but they are less concrete, like the name of the guy leaning against the railing on the deck with me, watching the dark water of the Dnepr. He was talking to me about politics in that way Ukrainian boys who went to good universities have perfected. Intellectual, but not neurotic. Saying big words in a rough voice. He spoke mostly in Ukrainian, I answered back mostly in Russian. This is what people used to do in Kiev. This is what they still do. That same summer, the Berkut guy would call me and always ask the same question. “Do you like the fact that I am calling you?” I would answer sincerely to what wasn’t a sincere question. Flirting is never sincere anyway – base desire is. That summer I thought a lot about matrices. I had just enough time to kill. I thought about the matrix I existed in. I thought about the matrix of the Berkut guy. I was “officially” seeing another law enforcement official at that time. He was a brutish intellectual, or an intellectual brute. He had the most interesting stories. I was never alone everywhere I went, and I was extremely lonely. As the days waned, the golden haze of the mornings seemed slightly burned around the edges. The Berkut guy is a two-sentence tale I can now tell at parties in Moscow. Muscovites like those kinds of stories. But I always end it on a note of doubt. Is he still with the special units? Has he shot anyone? Was he set on fire? Is he a killer? Is he a good man? It’s the kind of status update that will get likes on Facebook, if you tell it right, and if your timing is correct. On a boat on the waters of the Dnepr, which are always pulling you down and down, I cut my finger somehow on the railing. I was too stunned to react to it properly, at first (I spent a lot of time that summer being stunned). The boy I was with interrupted his monologue about national policy on linguistic diversity (I *think* it was linguistic diversity), took my hand and put my finger in his mouth. I was extremely lonely that summer. Kiev swallowed up my loneliness much in the same way it swallows up blood. Expertly and without much fuss. I never did go on a proper date with the Berkut guy. I saw him only one more time, in a sandwich shop that was depressing even by the standards of the rude bank clerks working next door. He didn’t seem happy to see me. As if he had never gotten over some kind of initial embarrassment. We were all part of the same pattern, but that summer, God got bored and knocked the chessboard over. I’m old enough now to talk about old lovers with a degree of wisdom, or else wistfulness masquerading as wisdom. But this isn’t a story about old lovers. If it was a story, I would tell you that I was seeing a prosecutor, but longed for the Berkut guy in an instinctual kind of way. He practically saved my life! He obviously saved my hair! If it was a story, I would tell you that I was in love with the guy from the boat ride. The truth is, I’m still not sure if I know what love is. But, like an astronomer trying to gauge the size of a far-away planet by looking for clues that gravity provides, I can sort of figure out some things about it. I can sort of, maybe tell you that love is this very basic, very utilitarian, very stable kind of state of being. And that most people who have love in their lives will deny it, because they’re afraid of sounding like a pop song. Going by that definition, I love Kiev. Every once in a while, I’m forced to conclude that it loves me back. It loved me back that summer, when the Berkut guy hastily kissed me and walked out of the sandwich shop and out of my life. It loved me back on that boat, when, as the black water ran beneath us, me and my companion fell silent, and watched the river, everything between us unsaid. The water whose path and flow allowed for the creation of the city ran so deep and cool. It was like watching time. If you stand outside of time and look at Kiev, you will probably see just one structure. And all of us embedded in it, in every possible state. 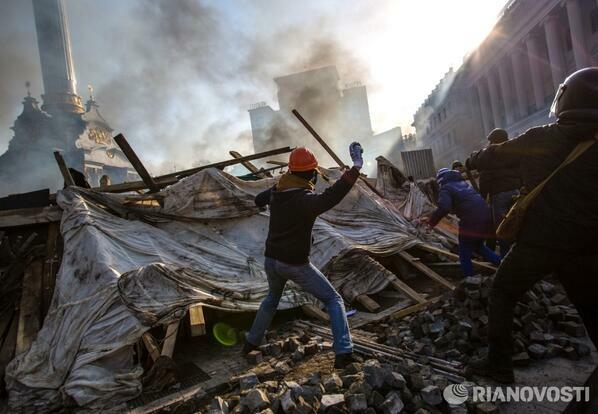 Clashes in Kiev a few days ago. Photo by my colleague Andrei Stenin. When the Berkut guy kissed me, the fire already burned and the bullets flew. When that guy on the boat licked the blood off my finger, Yulia Tymoshenko was already jailed and already freed and already addressing a crowd from a wheelchair, prompting the kind of halfway-ironic discussion on wheelchair access and lack thereof in Kiev, and whether another post-revolution Kiev would get better in that regard. I can’t tell you what the lips of the Berkut guy tasted like. I don’t think the guy on the boat remembers the taste of my blood. But if this was a bad movie, these two men would meet on the barricades, and be stopped from killing each other by a deus ex machina with lipgloss and blond hair (or maybe, in this version, the hair would be red). If this was a story, it would have an ending, but it’s just a pattern. Patterns are part of bigger patterns. That is both a great sadness and a great comfort. I feel so much older now – while Kiev feels younger. Maybe because timelessness is the only eternal youth that any of us will ever know. Kiev’s ghosts are awake and are putting on their pearls for a night on the town. Far away in Moscow, I stand by the window, alone in the dark, and wish them well. Hold on to something solid so you don’t get swept away in all these feelings and memories. You are still very young, a young mother with a toddler who is destined for great things. Kiev has been there for 2000 years, and it will be there for a long time more. Well, it’s not like he was at work at the time, so it probably doesn’t count. But I did start thinking of him again after I saw these women in national dress kissing riot policemen in the early days of Euromaidan. You’re a pretty cool writer, but I find it pretty fascinating that you admit to dating Ukrainian law enforcement. Aren’t these people ALL supposed to be thugs? I understand that you say that you were younger, but isn’t this the kind of embarrassing biographic detail you would rather leave unsaid? To go further, I just think it’s really strange and wrong for a politically aware woman to construct a narrative where the thugs are humanized. Just because you find someone hot doesn’t make them a good person. Sorry. I get that you were skirting around the issue in your essay, but maybe you should just come out and state the truth. Oh, yeah, you’re totally right. They are ALL thugs. And not just that – they are also ALL vampires. So they’re not even human, you see. I’ve engaged in illicit, interspecies love, and you’ve just found me out! I don’t know when the Ukrainian Berkut was founded or by whom (Kuchma? Yushenko? ), but Natalia’s story apparently dates from before the EuroMaidan demo’s. Per reports, Berkut personnel vary in their degree of humanity. During and after the EuroMaidan demo’s, Berkut units in Lviv in west Ukraine (and Ternopil?) and later in Dniepropetrovsk in east Ukraine handed their weapons over to EuroMaidan protestors/reps. Besides, Natalia, like everyone else, dates human beings, not political stereotypes. It’s not like she was dating the Gestapo. What I found weird was that guy who put Natalia’s finger in his mouth. Strange thing to do. Not to draw this out, but by report, the Berkut units that brutalized protestors in Kyiv were apparently drawn from the Crimea (majority Russian) and wouldn’t have sympathized with the EuroMaidan. Unless Natalia’s boyfriend was in one of those units, he might not have fit the stereotype of the brutal Berkut officer. Again not to argue too much, but those weapons handovers by Berkut units in various cities were reportedly *voluntary* and uncoerced, particularly in Lviv and Dniepropetrovsk. Just saying that it’s important to get the facts before imposing stereotypes on Ukrainian security personnel. Reblogged this on areej2014's Blog. I loved the writing and felt your sadness…Thank you for sharing! Reblogged this on Мой блог. Loved the post. Well written. Wonderful post and beautifully written – has given me a lot to think about. I wish for a great change in Kiev and freedom for all. May peace come soon for all! I never would’ve thought to consider the humanity of a riot police officer before, what an interesting tale you tell. Interesting perspective outside of commercial media outlets. I sense there is much more to your writing and you’ve just scratched the surface. Let loose and instill your positive self. Very good post and very well written! Reblogged this on "Historias de un baño público".